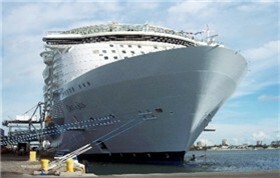 Royal Caribbean International announced a new smoking policy onboard its ships, effective January 2008. Royal Caribbean is increasing smoke-free zones. All staterooms and one lounge on each ship will be considered as non-smoking areas. Feedback from guests was a driving force behind the new Vitality program and the line's focus on wellness. Previously, smoking was prohibited in guest hallways and corridors, restaurants, entertainment venues and most of the ship's interior public spaces except for designated areas in bars and lounges. The new policy now includes all guest staterooms and suites and one bar or lounge on every Royal Caribbean ship. Guests wishing to smoke may still do so from starboard outer decks, in designated areas in bars and lounges, and on stateroom and suite balconies. Ashtrays are available in designated smoking areas or by request through stateroom attendants. Violations of the smoking policy will result in cleaning charges added to the guest's onboard account. And line could remove guests from ships if they create problems. Visit www.royalcaribbean.com. If you head onto your cruise ship balcony and view Central Park foliage and not the ocean, you're not looney, you're on Royal Caribbean's Oasis of the Seas. Similarly, if you stroll amid shops and restaurants and notice one bar floating up, up and away, don't think you're in Oz and explain, "I don't think we're in Kansas anymore Toto." You're simply on Oasis of the Seas. She's NOT a typical cruise ship. She's a wow ship! When it comes to family fun, Royal Caribbean International delivers with a host of onboard activities including the robust Adventure Ocean and Fisher Price kids' programs. Kids facilities, babysitting services and new dining options for kids are making life easier for parents. Lizz Dinnigan, a freelance writer and copy editor, recently headed to sea on a Royal Caribbean Voyager-class ship with her family. Let's sail away with Lizz! Liberty of the Seas is 160,000 tons, and, jointly (with sister Freedom of the Seas) holds the world's largest ship title. 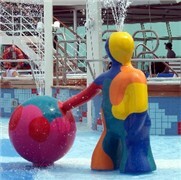 Liberty's bold features include a surf pool, skating rink, imaginative children's waterpark and boxing ring. Liberty also boasts a classy, elegant design and an $8 million art collection. So, let's explore the new ship! Please be patient during the "load" as this story is graphic intensive with 27 photos. The newest, largest ship at sea is Royal Caribbean International's Liberty of the Seas. For a complete ship inspection, see our Front Page story. But we thought you might also enjoy this "Photologue" of shots from a recent Liberty cruise. 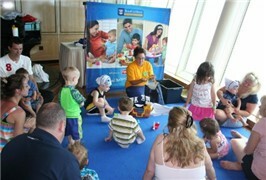 Royal Caribbean's Majesty of the Seas has always delivered good food, entertainment and service. But the ship -- launched back in 1992 -- was showing wear around the edges. Freelance writer Roberta Sandler who has sailed on Majesty many times couldn't wait to get on again earlier this year after Royal Caribbean completed a multi-million-dollar makeover of the ship. Roberta reports back to readers on her observations. She explains what she liked and what she didn't. 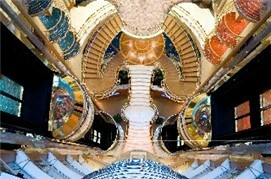 And, she offers perspective on what you can expect if you sail on the revitalized Majesty.